During the past half-century Gordon Tullock continually advanced the frontiers of political economy, most particularly with respect to the workings of representative democracies and of autocracies. 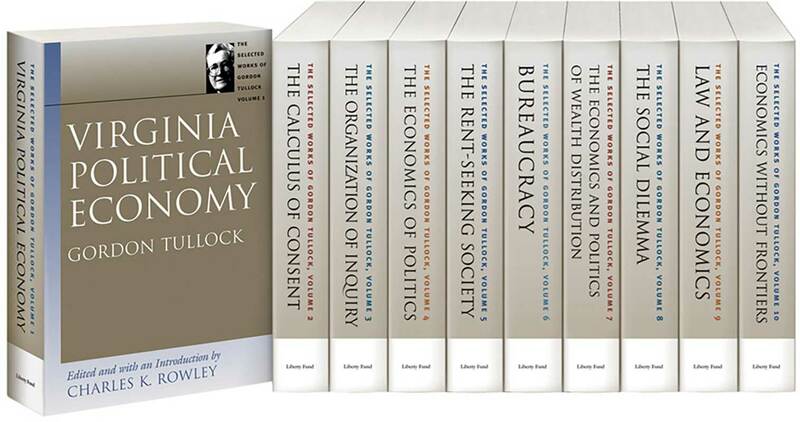 This ten-volume series, edited and arranged thematically, brings together Tullock’s most significant contributions to economics, political science, public choice, sociology, law and economics, and bioeconomics. Scholars will undoubtedly find the extensive breadth and depth of Tullock’s writings enriching. The general reader, as well as the student of politics, and all who love economic liberty, will find Tullock’s prose lucid, readable, and sprinkled with wit. His forensic argument is penetrating, compelling, and clear, and his brilliant mind is surprisingly accessible to us all. The Selected Works of Gordon Tullock provides an entrée to the mind of a legend in the field of political economics. Professor Rowley gives a deliberately sparse contextual introduction to each volume, opting to allow the very able and eloquent Tullock to speak for himself. Gordon Tullock (1922–2014) was Professor Emeritus of Law at George Mason University, where he was Distinguished Research Fellow in the Center for Study of Public Choice and University Professor of Law and Economics. He also taught at the University of South Carolina, the University of Virginia, Rice University, Virginia Polytechnic Institute and State University, and the University of Arizona. In 1966 he founded the journal that became Public Choice and remained its editor until 1990. Charles K. Rowley (1939–2013) was Duncan Black Professor of Economics, a Senior Fellow of the James M. Buchanan Center for Political Economy at George Mason University, and the General Director of the Locke Institute.